Instruction for use: Use a condiment for Chinese Coup Dishes. 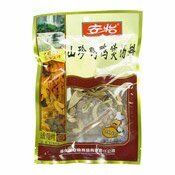 Ingredients: White Beans, Chinese Yam, Date, Mushroom, Platycodon Grandiflorum, Coix Seed, Platycodon Odoratum, Lily. Simply enter your details below and we will send you an e-mail when “Shanzhen Jiya Dried Mixed Vegetables For Soup (山珍雞鴨煲湯料)” is back in stock!